These shamrock socks are perfect for any Irish baby from age new born to 36 months. 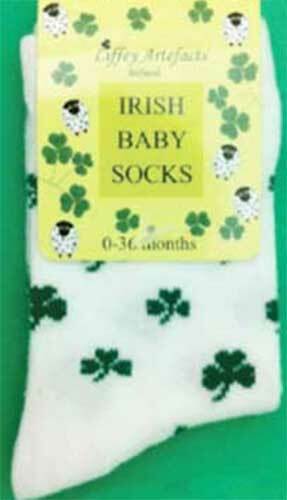 The Irish baby socks feature a printed green shamrock motif and are 75% cotton and 25% nylon. The baby socks are made in Ireland by Liffey Artefacts and are received with a shamrock history card, complements of The Irish Gift House.